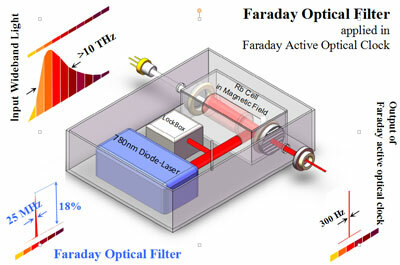 The Faraday optical filter has a bandwidth of 25 MHz and a transmission of 18%. When applied in Faraday active optical clock, the filter together with 10 THz-spectral-width semiconductor fluorescence could produce stimulated emission light with a narrow linewidth of 300 Hz. Faraday atomic optical filter is widely used in many fields, such as free space optical communication, lidar, laser frequency stabilization and atomic optical clock. Researchers aim to realize a filter with high transmission, narrow bandwidth and high noise rejection etc. Moreover, an atomic optical filter with both ultranarrow bandwidth and high transmission is a key component in Faraday active optical clock, which is a new kind of atomic optical clocks. The research group, led by Prof. Jingbiao Chen, from Peking University, China, achieved the narrowest bandwidth of the filter at 87Rb D2 line reported by far via combining velocity-selective pumping and Faraday anomalous dispersion effect. It is reported in Chinese Optics Letters Vol. 12, No. 10, 2014 (http://www.osapublishing.org/col/abstract.cfm?uri=col-12-10-101204). The researchers realized an atomic optical filter at 87Rb D2 line with a bandwidth of 25 MHz and a transmission of 18% based on Faraday anomalous dispersion effect and velocity-selective pumping. The filter is composed of two permanent magnets producing the axial magnetic field, two polarization-orthogonal Glan-Tayor prisms with an extinction ratio 105:1, and a frequency stabilized 780 nm diode laser. The transmission spectrum of the atomic optical filter was studied with and without pumping laser and the dependence of the bandwidth on temperature of 87Rb vapor cell, pumping intensity and axial magnetic field intensity was specially analyzed. Finally, an atomic optical filter working on optimal conditions for Faraday active optical clock was implemented. The atomic optical filter with ultranarrow bandwidth from this research has already been applied in the Faraday active optical clock in Peking University. "Faraday active optical clock is a new concept we introduced," Prof. Jingbiao Chen says. "We believe, Faraday magneto-optical effect discovered by Michael Faraday in 1845, will help us to build the modern optical atomic clock. Thus the achievement of the atomic optical filter with ultranarrow bandwidth from MHz to kHz is critical for the new-generation optical atomic clock". Moreover, the result will reduce out-band noises and improve signal-to-noise further in the fields of free space optical communication, lidar and so on. Further works will be focused on integrating the atomic optical filter into the Faraday active optical clock, meanwhile utilizing the narrow optical clock transition lines of alkaline earth metal atoms, like the 689 nm transition with 7.6 kHz linewidth of strontium (Sr).